I wrote this article for Tournaments Illuminated and it was recently published in Issue 200, Fourth Quarter 2016 p.15-19. 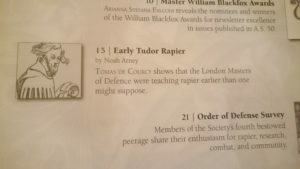 Early Tudor Rapier: The teaching of the rapier in London before 1580 by the Masters of Defence examines the history of the rapier in Tudor England and how early it was accepted by the nobility, gentry, and yeoman classes. The rapier was being used by the nobility and gentry at least by the 1540s and was being formally taught to and by the yeoman class through the Masters of Defence of London by 1568, a year before Bonetti arrived in England. Discussions about the origin of the use of the rapier in England frequently begin by focusing on the very late 16th C. This makes sense, as two Italian-authored rapier manuals were published in England in the 1590s: His True Arte of Defence by Giacomo Di Grassi was translated from his 1570 Italian version and published in 1594, and Vincentio Saviolo, His Practise was published in 1595. George Silver’s 1599 Paradoxes of Defence, with its brief discussions of the rapier, round out the decade. Silver’s work also allows us to track back the teaching of rapier in England to Italian fencing master Rocco Bonetti and his successors: Jeronimo, who was also likely the translator of Di Grassi, and the aforementioned Saviolo. Dating the history of the rapier in England to Bonetti’s school is fairly common (Lennox 38). But Silver ignores that the teaching of rapier was already established in England before Bonetti arrived there in 1569 (McCollum), and well before there is confirmation of his school being in operation in 1576 (Cook 72). Accounts from the 1630s set the time when the rapier replaced the sword and buckler as the weapon of choice for civilian combat as being “20. yeare of Queene Elizabeth” (Norman 24), or about 1578. But in order for a weapon to become popular there has to have been training beforehand, and that is where the Masters of Defence of London are key. 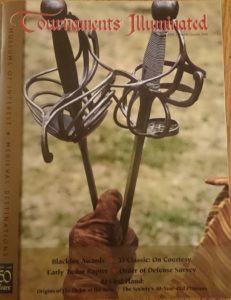 It’s my hope that this article will bring more context for those with an English persona and who have an interest in the rapier, as well as those wanting more information on the Masters of Defence.